In a town known for wicked awesome sandwiches (hello, lobster roll! ), sorting out the best sandwich in Boston is an exercise in fun. 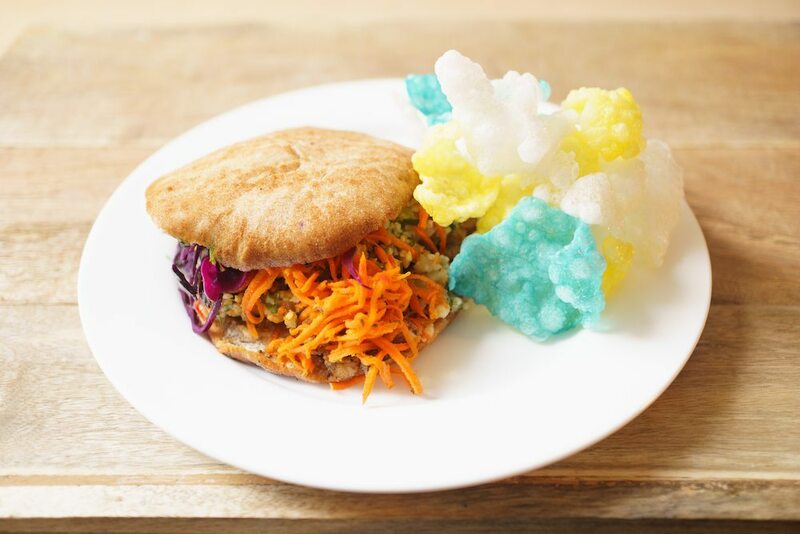 Trend reports vary, but according to Money magazine, sandwich catering in Boston will soon be influenced by a spike in national interest in the Vietnamese-style sandwich known as the banh mi. Boston knows a good trend when it sees one. Middle Eastern influences, such as pita stuffed with shawarma and sandwiches showing their Mexican heritage are in. Even Japanese-style pancake sandwiches are a thing. In Boston, sandwich catering also benefits from the rise of toast (really an open-faced sandwich) and the eternal appeal of grilled cheese. Let’s take a look at what’s craveable in sandwich catering around Boston and get to some good eating. 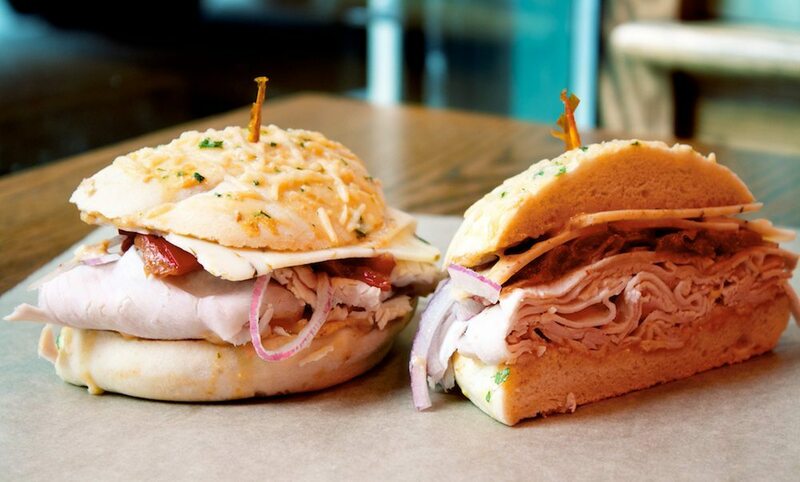 Who says the best sandwich in Boston has to be a sandwich? 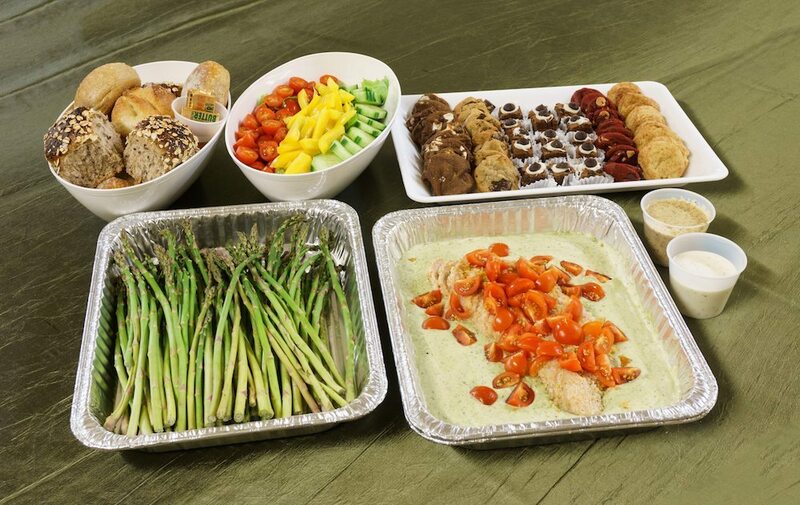 Wicked Catering knows its way around a hot entrée and serves up everything from quinoa fried rice and grilled balsamic salmon to Boston clam chowder and penne provençal with chicken and artichokes. When it comes to sandwiches, breakfast options like a steak, egg, and cheese burrito or an Iggy’s croissant stuffed with garden vegetables, egg, and cheese makes a great partner for coffee. Vegetarian sandwiches, like the portobello press with sautéed red peppers and jack cheese, or the Left Coast with avocado, sprouts, and gouda, are exceptionally popular. 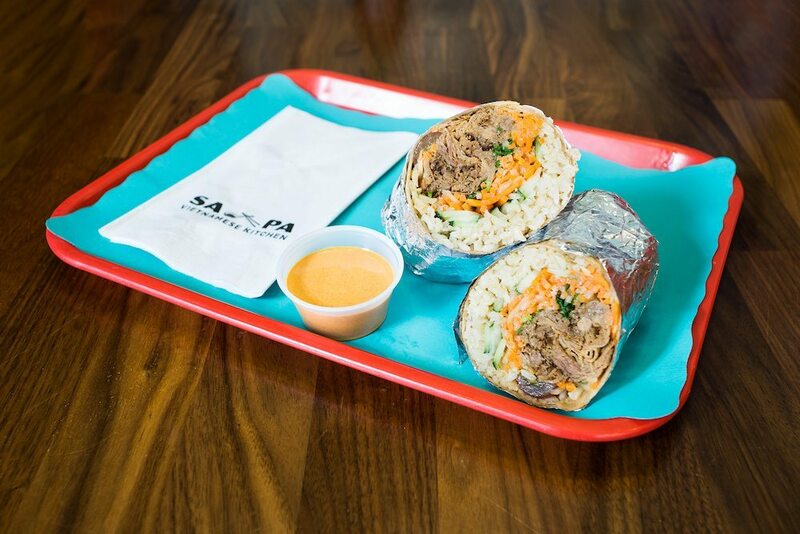 Meatier alternatives, such as Birds of a Feather with grilled chicken, avocado, and herbed mayo or achiote pork and pineapple stuffed into the Merida burrito, are as satisfying as they are flavorful. Though they likely cannot take credit for inventing the banh mi, SA PA’s banh mi sandwich box is SA PA’s most popular catering sandwich option and a likely contender for best sandwich in Boston. Choose from proteins like barbecue pulled pork and marinated tofu, then select homemade miso mayo or spicy curry mayo to complement the protein’s flavors. The sandwich comes together with mushroom-walnut pâte, pickled carrots and daikon, grapes, cucumbers, and cilantro, all on a toasted baguette. Or choose the banh mi burrito box for the same fillings and dressing options wrapped with rice in a Mexican-style flour tortilla. Make Your Own Bowl, with a base of rice or vermicelli noodles, can be prepared with kimchi or bok choy in addition to the proteins and dressings. Add an order of coconut banana pudding with tapioca pearls to perk up dessert. Given the sheer number of wrappers available to build the best sandwich in Boston, it could be fun to vary a sandwich catering order to include something traditional yet altogether trendy. Trio’s breakfast options include crepes, a kind of French rolled-up sandwich, and an entire gluten-free sandwich breakfast tray with ham, sausage, bacon, vegetables, egg, and cheese. (Gluten-free options extend to the deli sandwiches, and lasagna, too.) 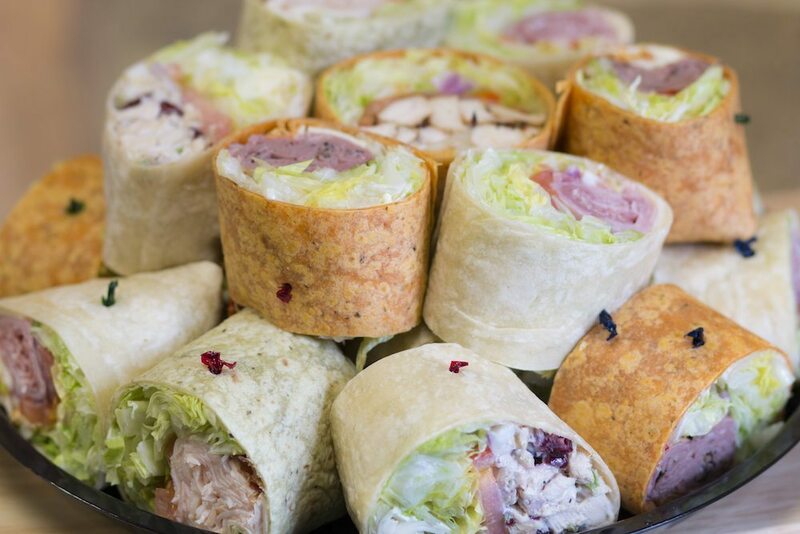 On the wrap platter, choose popular sandwiches such as cranberry walnut chicken salad, roast beef, or Italian meat lovers. But who says the best sandwich in Boston has to have meat or seafood? Give the popular grilled portobello wrap a try. Layered with meaty mushrooms, grilled onions, fresh basil, tomatoes, and mozzarella cheese, it is a hearty meal. Or go Med with the Greek wrap with feta, olives, and plenty of fresh vegetables. You’ll be singing “Mama Mia!” for the rest of the afternoon. Steak and cheese is not just popular in Philly but it is a great option for sandwich catering in Boston. 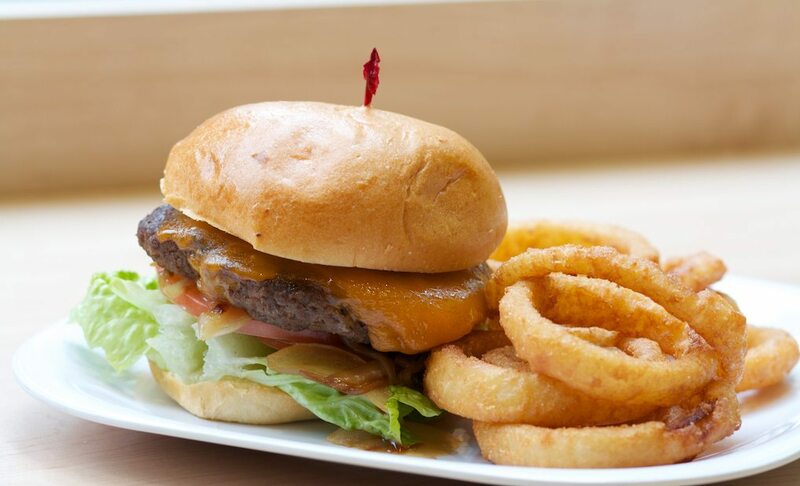 Andre’s Café offers two sizes of their steak and cheese sandwich, ideal for light and hearty appetites. The shaved steak melds with the sautéed onions and melted cheese for an incomparable flavor experience. Served on a dinner roll, the bread stays fresh and not soggy. This sandwich is so popular, Andre’s added a crispy chicken club with fried chicken, melted cheese and crispy bacon and a spicier version called the buffalo chicken sandwich to their sandwich catering in Boston. Shrimp or veggie skewers are a twist on the kabob trend (though they have those, too) or try one of the wraps. The word on the street says the falafel wrap, made on fresh pita using an ancient Egyptian recipe, is popular with everyone, not just vegans. The sandwich platter is Uno Due Go’s most popular order. Choose from classics like the turkey, bacon, and swiss wrap or go global with the Mumbai samosa wrap. Salads, like the black-bean burger salad with greens, roasted corn relish, cheddar, tomatoes, and chipotle aioli dressing, though not exactly sandwich catering, are a fun choice here. Or try the goji-berry power salad with spinach, chicken, carrots, tomatoes, goji mix, grapes, and feta cheese. For dessert, an item called Snack Bars and Berries adds a boost of antioxidant power while Coffee Cake Break, served with coffee, includes miniature lemon poppyseed loaves, deep-dish blueberry buckle, and strawberries. It really is all about the berries. Inspired flavors of the Eastern Mediterranean are at the heart of the menu at Dates & Olives. When ordering sandwich catering in Boston, you cannot go wrong with Dates & Olives sandwich selection. 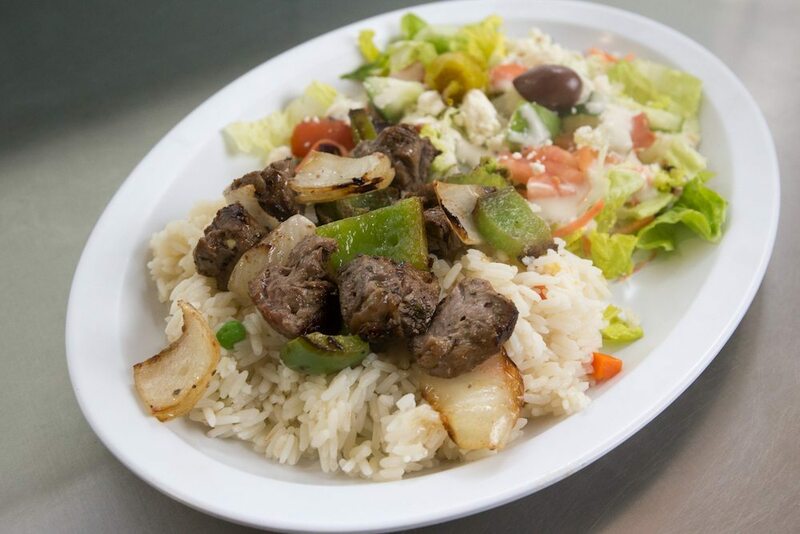 House-made pita is stuffed with grilled vegetables, falafel, or halal beef or chicken. (The yummy bread takes the meaning of ‘best sandwich in Boston’ to a new, better place.) No matter the protein, all are served with hummus, red cabbage slaw, carrot-raisin salad, pickled turnips, and house-made chips. The signature platter from Dates & Olives presents the salads individually with gluten-free millet tabbouleh. Or try the popular farro with butternut squash and kale salad. It is not gluten-free but it is a bountiful entrée for cool spring evenings. 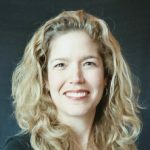 Known for their Pastrami Traveler’s Sandwich, with Rumanian pastrami and Vermont cheddar, Sam LaGrassa’s jumbo reuben with corned beef, sauerkraut, and Russian dressing is a taste of sandwich catering in Boston via the Caucasus. Try it as part of the popular assorted specialty sandwiches order which includes numerous gluten-free and vegan options, such as the vegan buffalo mozzarella sandwich and the gluten-free pastrami po’ boy with honey mustard and a gluten-free tortilla. The best sandwich catering in Boston comes in all sizes but for those days when you want comfort food, Max’s has got your number. Jumbo Stuffed Mushrooms are a fun, familiar appetizer and the pasta fagioli soup is down home Italian at its finest. The sandwich tray boasts a salmon salad sandwich and a jumbo BLT. Or try the chicken parmesan or meatball sandwich. Roast Thanksgiving Style Turkey Big Boy Sandwich and Brisket Burnt Ends Big Boy Sandwich served with horseradish cream sauce are great options for robust appetites. Finish off a meal with a jumbo cookie or a mini cookie tray. Bagels and cream cheese make a great sandwich at any time of day and Café de Boston has gluten-free bagels, too. 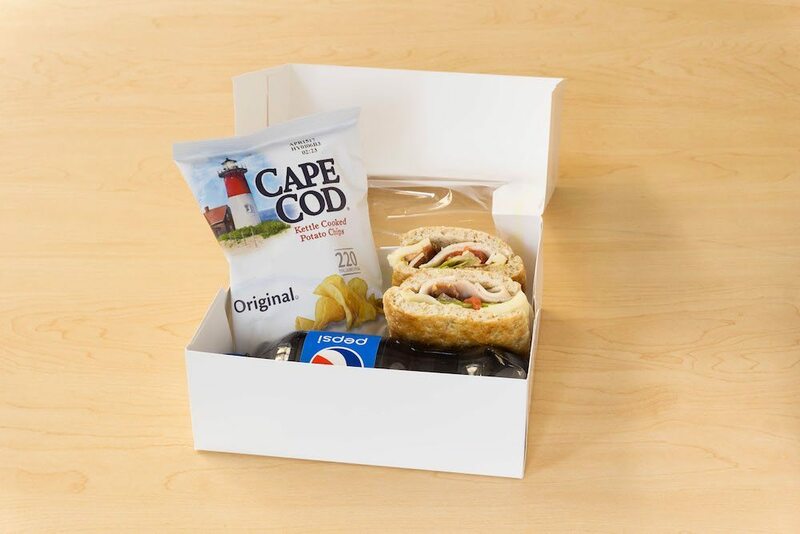 The deluxe boxed lunch offers plenty of sandwich choices for all kinds of eaters. Pepper jack cheese and Sriracha layer on the spice in the Sriracha turkey sandwich or go classic with roast beef and cheddar or crab cakes on a bulky roll with mayo. 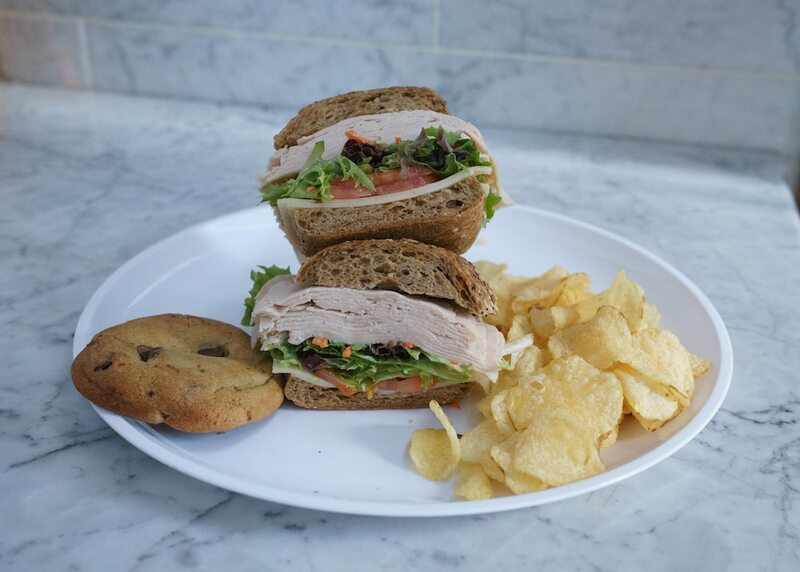 There are plenty of gluten-free options here and the gluten-free basil chicken sandwich with grilled chicken, American cheese, and basil pesto, is one of the café’s most ordered options. Breakfast is an all-American affair with a smoked salmon platter and yogurt parfaits rounding out the continental breakfast and muffin platter options, but the flavors of the world inspire the quinoa bowls. Try the Aztec with pinto beans and avocado for the flavors of modern Mexico or go for the Jamaican Jerk with fried plantains, toasted coconut, and cabbage. Specialty box sandwiches are equally international. Try the Asian tofu wrap for a hint of Vietnamese flavor or the Mediterranean wrap with roasted red pepper hummus, feta, and Greek dressing. They taste fresh no matter what time of day your event takes place. To spark up your next breakfast sandwich order or to find gluten-free breakfast and lunch ideas, read up on the trends impacting the most important meal of the day.